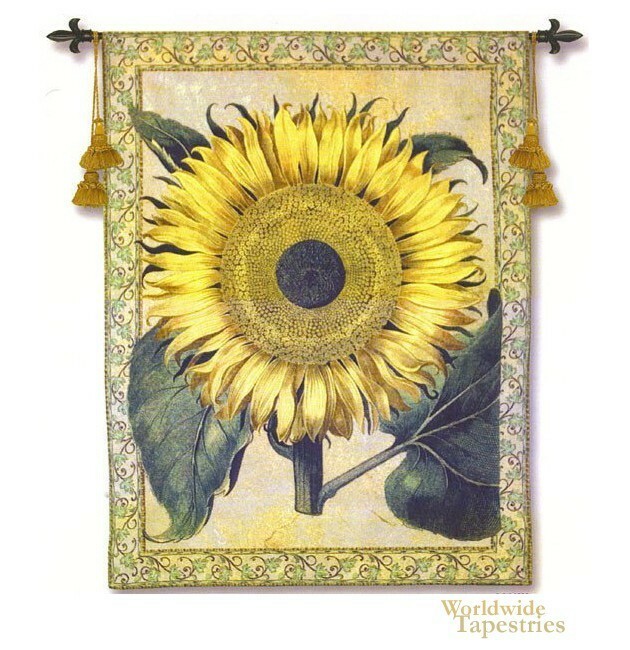 This tapestry "Flos Solismajor" shows a large sunflower in full bloom, Meaning literally "large sunflower", this tapestry is remarkable for its detail and impact. Based on the work of artist Ridgers, this work is a celebration of the beauty and radiance of the sunflower that has captured our attention since their discovery. It is thought that the first sunflowers appeared around 2600 BC in Mexico and since then has been a major part of culture around the world. They are known for their large flowering head or inflorescence with large yellow outer petals and their inner florets arranged in a distinct spiral pattern. The geometry is sublime and each floret is oriented to the next by 137.5 degrees to produce a pattern of interconnecting spirals, where the number of right and left spirals are equal to successive Fibonacci numbers. This pattern has been calculated into an equation by Vogel in 1979. The sunflowers are not just distinctive in their appearance but they also exhibit heliotropism, the ability to turn their heads to face the sun. This tapestry is not only remarkable in its design, but its use of color is also exceptional, with the yellows complimented by the deep greens perfectly. This floral tapestry "Flos Solismajor" is backed with a lining and has a tunnel for easy hanging. Note: tapestry rod and tassels, where pictured, are purchased separately. Dimensions: W 42" x H 54"